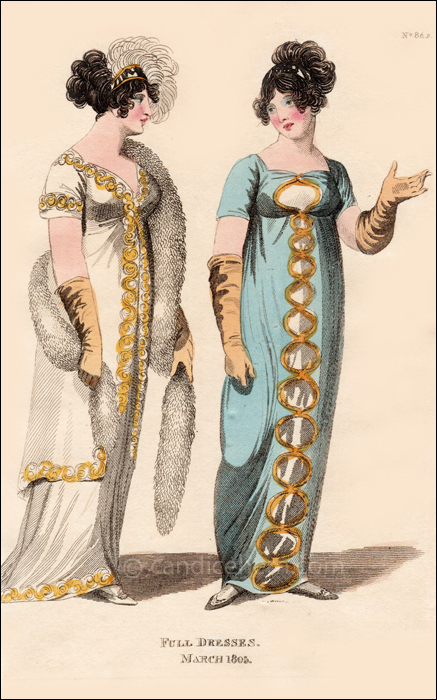 Fashions of London and Paris, March 1805. 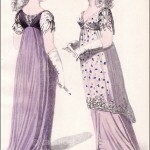 The dresses shown here were worn at a concert, ball, and supper given at Windsor Castle on February 25, 1805. The event was over a year in the planning. The Gentleman’s Magazine reported that the entire evening cost over £50,000. The king even commissioned a new service of sterling plate, “the most magnificent in Europe.” The invitation list included 390 “persons of distinction,”, along with the Royal Family and officers of state. The concert began at 8:00pm, and featured the Oratoria of Esther. The ball commenced at 10:00pm, with the first dance lead by the Duke of Cambridge and Princess Augusta, and ended at 2:00am, at which time supper was served. Wouldn’t it be wonderful to know which ladies of distinction wore these two dresses? 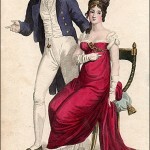 “TWO FULL DRESSES WORN AT THE QUEEN’S BALL AT WINDSOR. “Fig. 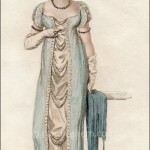 1.–A short dress and train of fine muslin, embroidered all round with gold. The hair dressed with a diamond bandeau, and white ostrich feathers.